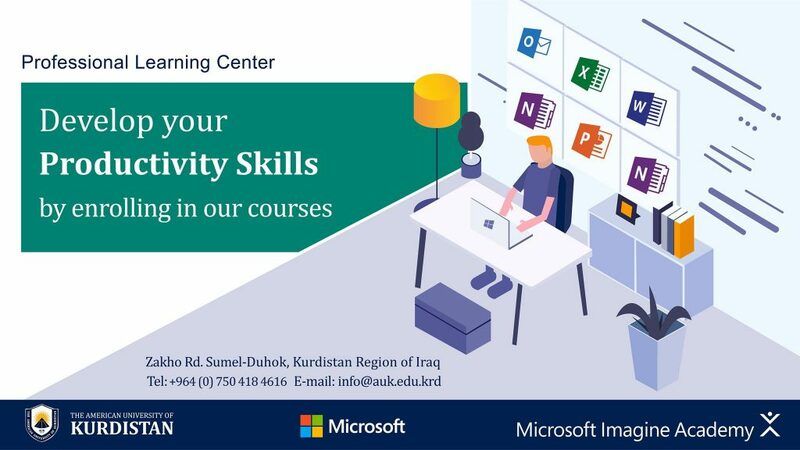 Duhok, Kurdistan Region of Iraq – April 15th, 2019 – The American University of Kurdistan announces the launch of the Microsoft Imagine Academy program in its newly established Professional Learning Center to provide students with real-world technology skills needed to thrive in the 21st century economy. AUK joins more than 16,000 Microsoft Imagine Academies around the world. “The professional learning center will be a stage for our students and community to develop their productivity skills using the most up-to-date information and technologies. Which as a result, will help them to secure jobs and contribute in the social and economic development.” said Mohanned Ahmed, Head of the Professional Learning Center and AUK’s office of Information Technology Manager. Microsoft Imagine Academy is a comprehensive program that supports ongoing technology education for students, teachers and other education professionals spanning computer basics to high-level programming, along with cloud and infrastructure management using Microsoft technologies. The program’s resources include access to online learning content, Official Microsoft Academic Courses, classroom curriculum, and instructor tools. Microsoft Imagine Academy will provide a convenient and flexible learning environment where students can get hands-on experience with the latest technology to gain a competitive edge in today’s job market or the next step in their academics. At the end of the courses, students will receive certificates from the American University of Kurdistan upon the completion of the program, that will enhance their employability opportunities. The American University of Kurdistan fosters an intellectual climate that encourages dedication to learning that extends far beyond the physical confines of the traditional classroom.